A high-tech lamp which can listen in on conversations in the homes has been created, to make people think more about privacy issues, it has been revealed. Dubbed ‘the conversnitch’ lamp, the device has its own Twitter account where it posts snippets of conversations that it has recorded. The lamp was made for under £60 and its current location is unknown. Essentially, it has been placed in a location where it then has conversations recorded unbeknownst to the people affected. It also tweets overheard conversations in public places. Kyle McDonald and Brian House are the creators behind the lamp, and they claim it only took a few hours to put together. This serves to highlight just how easy it is for these devices to be created and used widely. The creators of the spy device said that it was made to make people think more about privacy issues. They claim they were inspired by the NSA scandal unveiled by Edward Snowden. Previous conversations the lamp picked up was over topics such as a failed job interview, a strained relationship and problems at work. The device was made using a Raspberry Pi mini-computer, a microphone, an LED and a plastic flower pot. The device screws into a standard bulb socket from where it also draws power. Audio is secretly captured by the lamp, via the nearest open Wi-Fi network, and then sent to Amazon’s Mechanical Turk crowdsourcing platform. The lamp live tweets all recorded conversations it secretly picks up and gives Twitter users the chance to comment or favourite some of the snippets that were captured by the device. 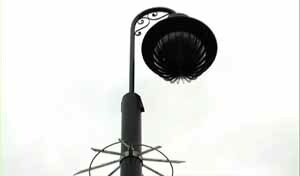 Last year, it emerged that councils across several major cities in England were inserting audio devices into street lamps, allegedly to counteract terrorism and crime. The Sigard system has been tested in London, Manchester, Birmingham, Glasgow and Coventry and uses microphones, connected to CCTV cameras and lampposts designed to pick up on certain ‘trigger’ words. It then zooms the camera in on the person holding the conversation. When news reports surfaced in the media in 2009 about the lamps, authorities claimed that the use of the lamps was a trial and had been scrapped. Later however, it was revealed that the lamps were still in use.